How would the creationism-evolution controversy have been different if World War I had never happened? Today the question is answered by Adam Laats, Associate Professor of Education and History at Binghamton University (SUNY). He is the author of The Other School Reformers: Conservative Activism in American Education (forthcoming). He blogs about conservatism, creationism, and education at I Love You but You’re Going to Hell. What would have happened differently in the creation/evolution debates if there had been no World War I? Naturally, historians get nervous at this sort of mental game, since history is always so shot through with surprise and illogic. Whatever happened need not have happened and no historian likes to say what could or should have happened. However, putting these worries aside, I’ll offer a simple equation: No war, no Scopes trial. At least, no “Scopes trial” the way we’ve come to know it. After all, William Jennings Bryan resigned his post as Woodrow Wilson’s Secretary of State over Wilson’s growing aggressiveness toward Germany. No sinking of the Lusitania, no resignation. No resignation, no last career for Bryan in the 1920s as America’s leading anti-evolution crusader. And, without Bryan’s celebrity involvement in the small-town test case of John Scopes in Dayton, Tennessee, Clarence Darrow would not have signed on to defend Scopes. Without the high-caliber involvement of the “Defender of the Faith” and the “Attorney for the Damned,” the trial might have passed by just as quietly as the American Civil Liberties Union had hoped. It might have allowed the ACLU to overturn Tennessee’s anti-evolution Butler Act through judicial appeal. Would evolution likely still have been a contested idea in the 1920s without a Scopes trial to dramatize the conflict? Definitely. 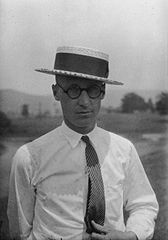 But the Scopes trial blended in issues of Southern regionalism, small-town boosterism, and a high-profile carnival atmosphere that changed the debate over evolution in significant ways. Without the war, without Bryan’s involvement, the popular meanings of evolution and anti-evolution would have been definitively different.